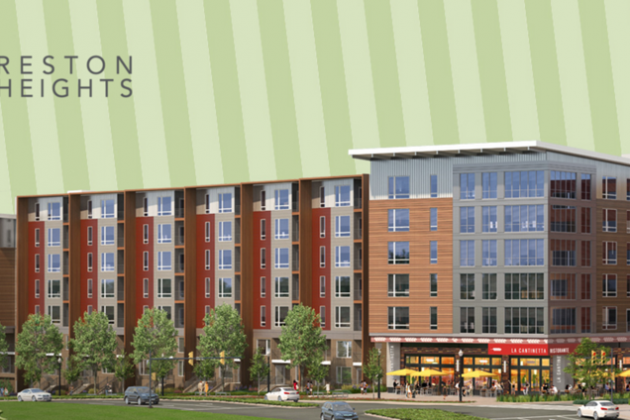 A little over a year ago, VY at Reston Heights unveiled a handful of retailers coming to the apartment community. Now, some of those retailers are getting ready for their openings. 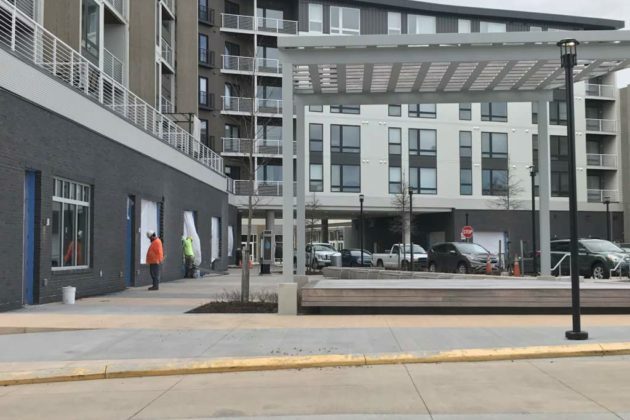 At a recent site visit, this Reston Now reporter spotted construction crews working on ground-level retail spots below the 385-unit apartment community (11830 Sunrise Valley Drive). 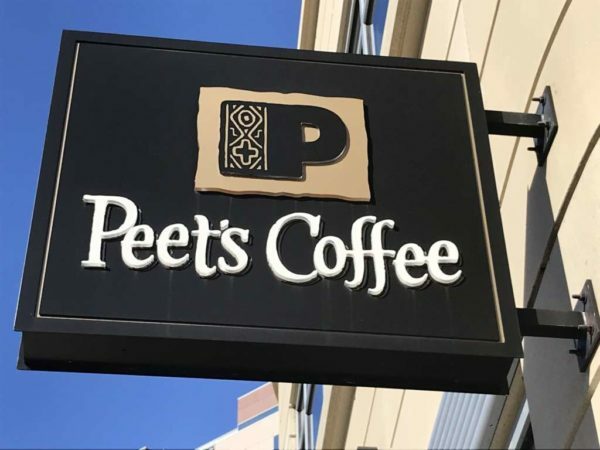 When Reston Now reached out to JBG Smith earlier this week to find out when the five retailers are set to open, a spokeswoman for the developer said that she wasn’t able to provide updates. Building permits for 11830 Sunrise Valley Drive, though, provided some insight. Two carry-out restaurants — My Home Thai and Reston Kabob — have permits for plumbing work. Another restaurant, Chicken Rico, has a building permit for a new tenant layout. Meanwhile, Men’s Spa and Barber has a permit for an interior alteration for a tenant layout. Once open, the restaurants and shops will be a quick drive from the Wiehle-Reston East and future Reston Town Center Metro stations. 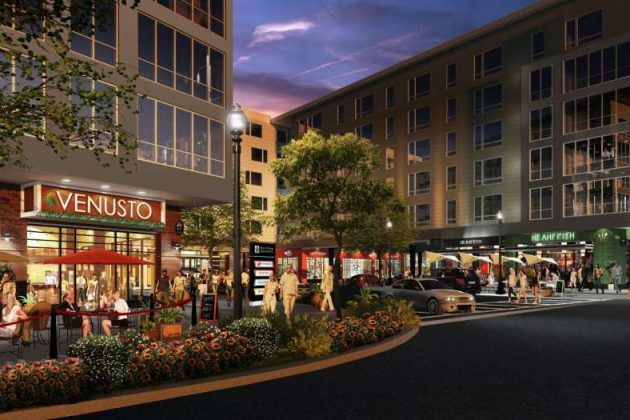 Roughly half of a dozen retailers won’t be affected by JBG Smith Properties’ newest proposed changes to the Reston Heights development. 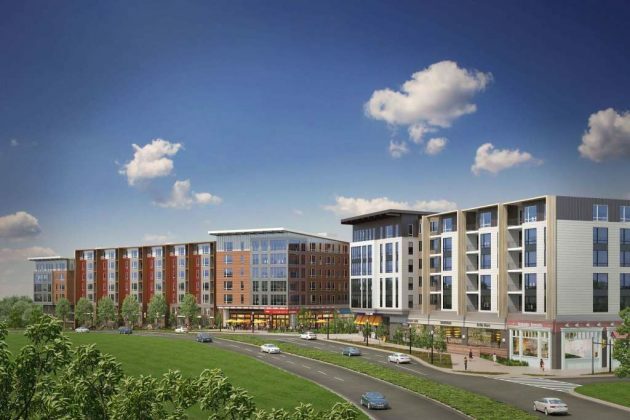 The developer filed a request with the Fairfax County seeking to scale back planned office and retail space at the mixed-use development near the future Reston Town Center Metro station, Washington Business Journal reported. The story says that the request includes the removal of existing entitlements for 215,000 square feet of office space, along with 3,600 square feet of retail space the company does not plan to construct at the 385-unit VY apartment community (11830 Sunrise Valley Drive). Meanwhile, that change keeps the planned retailers intact. 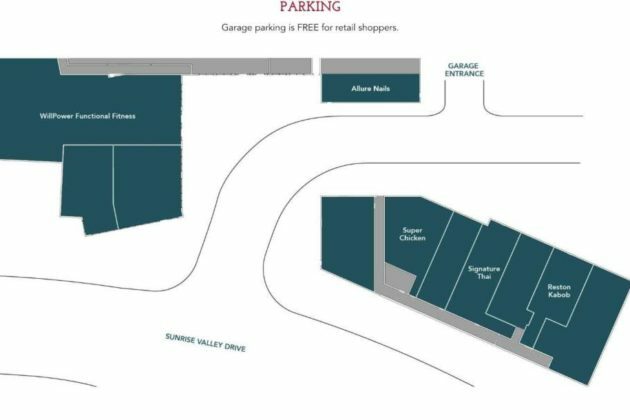 The retail space reduction won’t affect any of the previously announced retailers coming to Reston Heights, a spokesperson for JBG Smith told Reston Now. The developer announced several retailers for VY around this time last year. 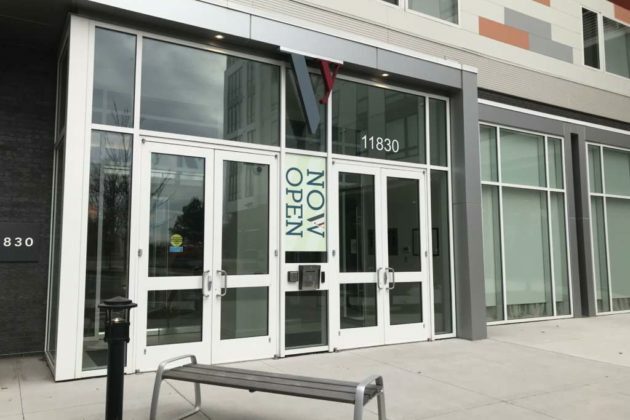 Willpower Functional Fitness, Allure Nails, Signature Thai, Super Chicken and Reston Kabob are all “coming soon” to VY, according to the apartment’s website. The more than 3,000 square feet of retail planned to be removed would be in the base of the building, the spokesperson said. 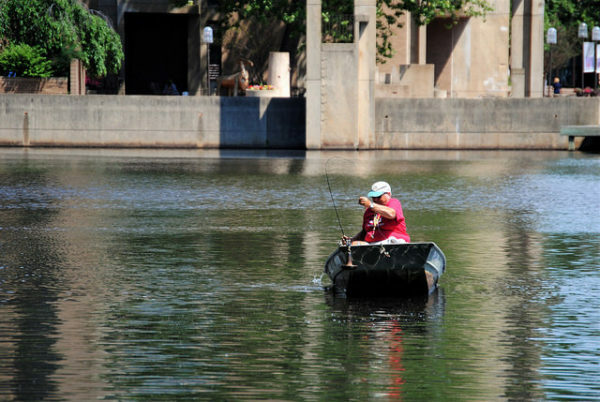 The Reston Association declined to comment for this story because neither the RA nor its Design Review Board has received any information from JBG Smith about their reconfiguration plans. “Any reconfiguration of the project by JBG Smith will have to come back to Reston Association’s DRB,” Mike Leone, RA’s spokesman, told Reston Now. JBG Smith would need approval from the county’s Planning Commission and Board of Supervisors to remove the office, Washington Business Journal reported, noting that this isn’t the first time the developer has sought changes to the site’s plans. VY, a 385-unit apartment community by JBG Smith, is officially open. Six tenants are expected to take up ground floor retail slots by the summer. Tenants include Super Chicken, Allure Nails, Signature Thai, and Reston Kabob. WillPower Functional Fitness, a 35,000 square foot gym, was the first retail tenant confirmed in 2016. 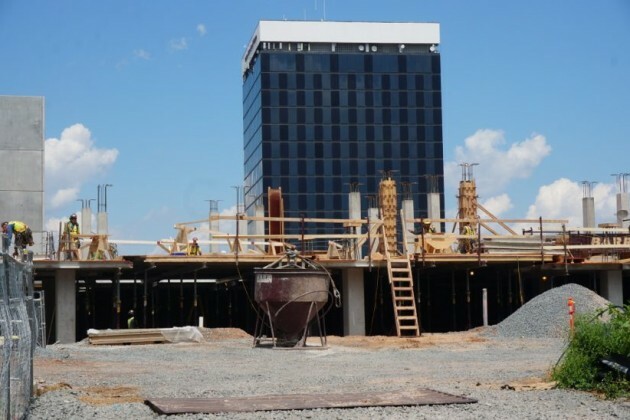 The building on 11830 Sunrise Valley Drive is part of JBG’s Reston Heights project, which includes Westin Reston Heights, the Sheraton Reston, the Mercer Condos and office buildings along Sunrise Valley Drive. 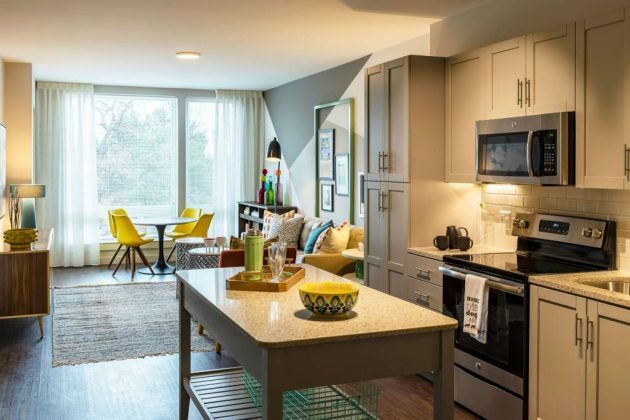 VY, which stands for “very,” contains a mix of one, two and three-bedroom apartments with two-story lofts.Monthly rents range between $1,800 and $3,320. Amenities include an two open-air lounges, a pool, fitness center, courtyard with fire pits, a lawn, on-site dog park, a pet spa and a bike maintenance center. 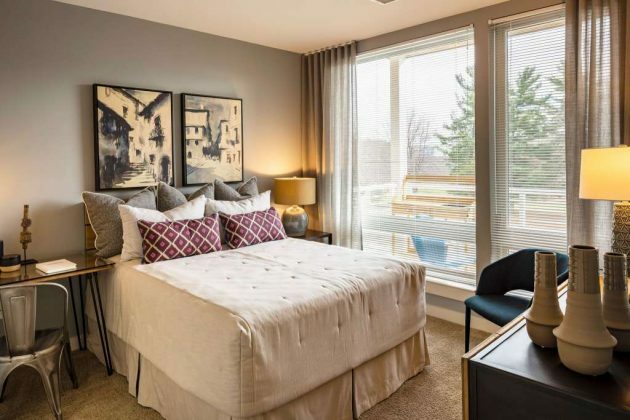 “The property sets the bar for luxury living in Reston with a high level of amenities, retail, and access to the outdoors and activities for the consumer who values both a quiet evening in a comfortable home overlooking nature, and entertainment or activity right outside of their front door,” he said. The surface lot area of the Reston International Center has gone from an old strip mall to a giant construction area seemingly overnight. 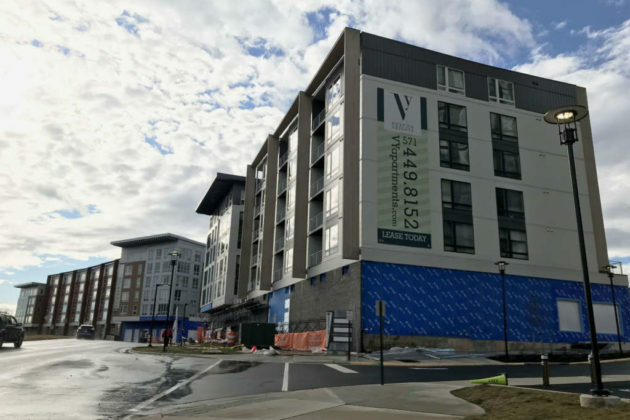 Actually, it has been a little more than six months since major construction work began in the eight-acre site on Sunrise Valley Drive near Reston Parkway. But you may have blinked — and then noticed a multi-story parking garage has been built. Let’s revisit what is planned for JBG’s development, which will be called Vy at Reston Heights. JBG’s application was approved by the Fairfax County Board of Supervisors in spring of 2013. The mixed-use development will be about a half-mile from the future Reston Town Center Metro station that is expected to open in 2020. VY is slated to open in late 2017 for residents and in early 2018 for retailers. Overall, the plan includes 89,000 feet of retail space (it has been approved for more than 200,000 square feet) and nearly 400 residential units. It has also been approved for 428,225 square feet of office space. Public spaces include will include outdoor dining and gathering areas, as well as an outdoor amphitheater. A six-story residential building featuring 385 units. There will be studio, one-bedroom and two-bedroom rental apartments. Twelve percent will be set aside as workforce housing. A five-level above-ground parking garage. 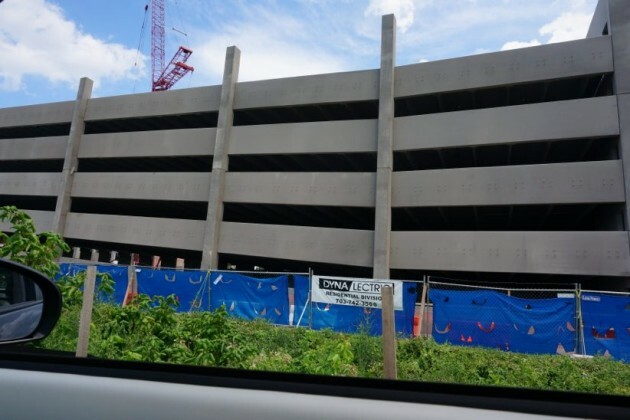 The garage you see currently under construction will have decorative exterior elements that include “tall natural wood beams that echo the vertical designs of Reston’s first buildings at Lake Anne,” JBG says. A 15-story mixed-use building. The first two stories would be split between two levels of parking and two levels of retail space. The two levels of parking will face the Reston Parkway frontage, while the retail space will face the central retail plaza. The remaining stories will be dwellings. A 10-story retail and office building with five stories of parking. The building will feature 3,600 square feet of retail and 100,000 square feet of offices. 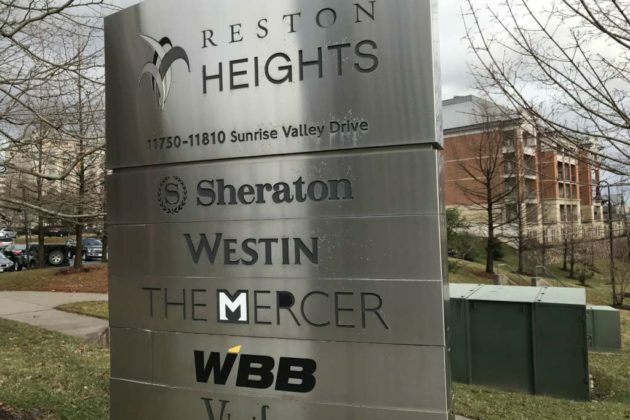 The Reston International Center tower will remain, and plans call for an additional 145,035 square feet of office space to be constructed on the northern side of the building. This addition would match the current building’s 203-foot height. Development conditions include widening of Reston Parkway, additional traffic signals, crosswalks, pedestrian access to the Metro entrance and bicycle parking. See the plans and the long list of development conditions on Fairfax County Planning Department’s website.